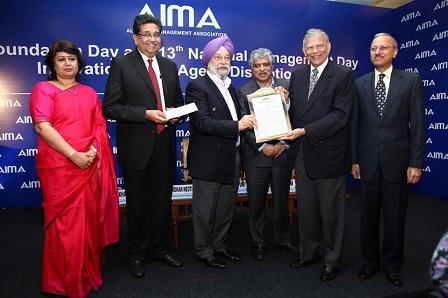 All India Management Association (AIMA) - the apex body for Management in the country, celebrated its 63rd Foundation Day & 13th National Management Day on 21st February 2019. 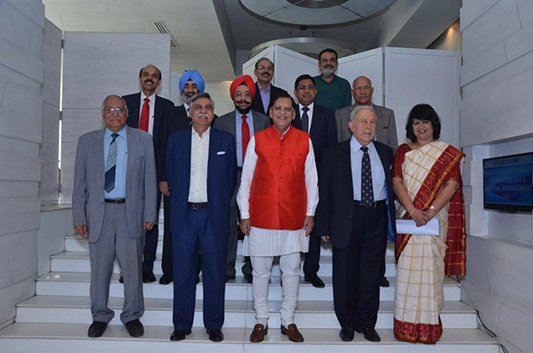 On this occasion, AIMA Awards of Excellence were also presented to the distinguished professionals chosen by an Awards Jury chaired by Nandan Nilekani, Chairman, Infosys Ltd.
Mr Hardeep Puri, Minister of State (I/C) for Housing and Urban Affairs was the Guests of Honour at the function. 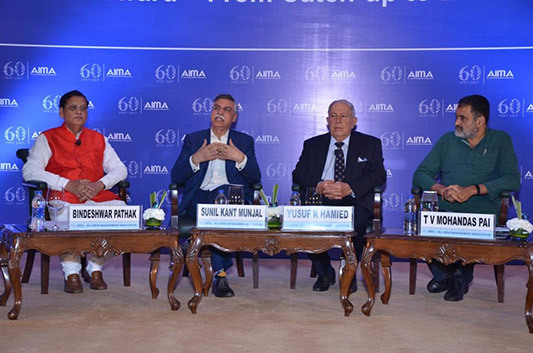 The event was also addressed by Nandan Nilekani, Chairman, Infosys Ltd, Aditya Puri, Managing Director, HDFC Bank Ltd and Vijay L Kelkar, Chairman, National Institute of Public Finance and Policy, Harshavardhan Neotia, President, AIMA and Chairman, Ambuja Neotia Group and Harsh Pati Singhania, Vice President, AIMA and Director, JK Organisation and Vice Chairman & Managing Director, JK Paper Ltd. 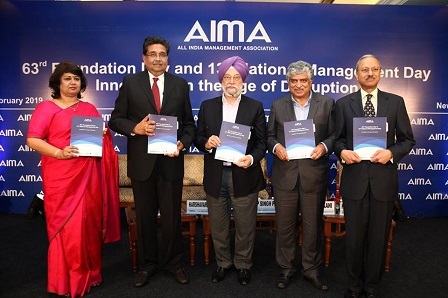 The All India Management Association (AIMA) - the apex body for Management in the country celebrates its 62nd Foundation Day on 21st February every year. This special day also coincides with the 12th National Management Day which is celebrated by the AIMA network of the 67 Local Management Associations (LMAs) all over the country. The main function in Delhi would be attended by close to 400 management professionals from industry, government, academia, media and management students. 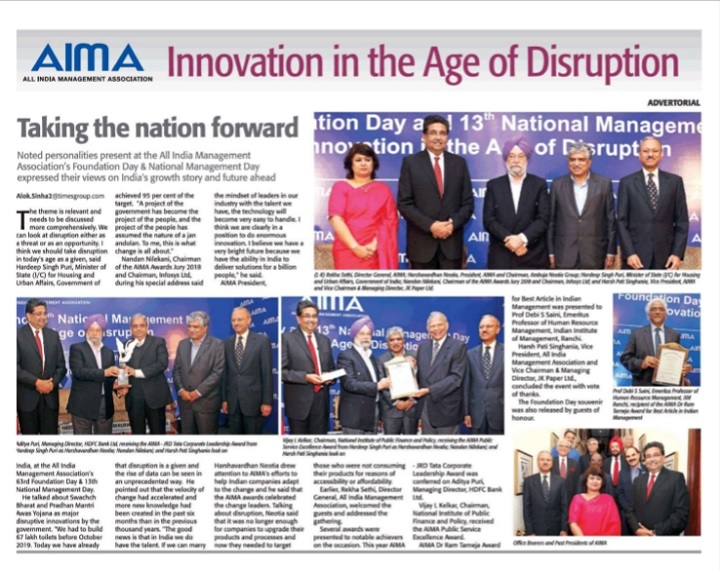 On this occasion, we also present the AIMA Awards of Excellence to distinguished professionals. These awards have been presented to leading corporates, scientists, bureaucrats and academicians in the past. 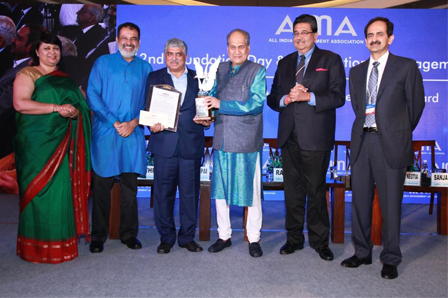 AIMA – JRD Tata Corporate Leadership Award to Nandan Nilekani, Non-Executive Chairman, Infosys Ltd.
Life Time Achievement in Management Award to Adi Godrej, Chairman, Godrej Group. Public Service Excellence Award to Anshu Gupta, Founder, Goonj. Dr. J S Juneja Award for Creativity and Innovation for Micro, Small & Medium Enterprises to Yantra Harvest Energy through its Ajit Ratanchand Shah, Managing Director. Kewal Nohria Award for Leadership in Management Education went to Dr Bala V Balachandran, Founder, Dean & Chairman, Great Lakes Institute of Management. Dr Ram Tarneja Award for Best Article in Indian Management was presented to Harish Bijoor, CEO, Harish Bijoor Consultants. The All India Management Association (AIMA) - the apex body for Management in the country celebrates its Foundation Day on 21st February every year and this year is special given its our Diamond Jubilee year. This special day also coincides with the National Management Day which is celebrated by the AIMA network of the 64 Local Management Associations (LMAs) all over the country. The main function in Delhi would be attended by close to 500 management professionals from industry, government, academia, media and management students. Dr. J S Juneja Award for Creativity and Innovation for Micro, Small & Medium Enterprises to Pawan Kumar Goel, Founder & CEO, Chemical Resources.